feature excellent color and gloss retention and are available in a wide variety of colors. Slide-Lok garage floors also feature a coating system that is both UV resistant as well as impact and abrasion resistant. , will not yellow or fade, and takes 1 day to apply. from Slide-Lok, you get the excellent service that you'd expect from doing business with the leader in the garage interiors market. 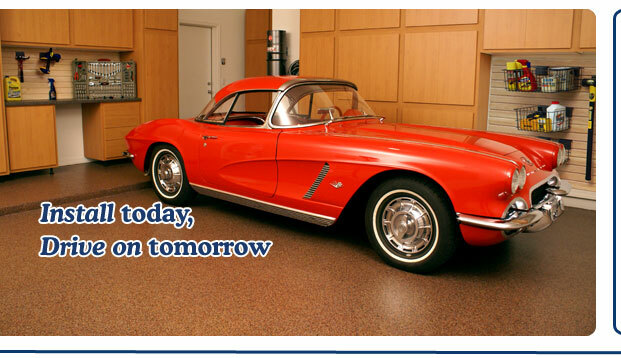 Garage Floor coatings by Slide-Lok utilize a new generation of fast-curing, polyaspartic material. Our garage floors can be applied at temperatures as low as -30oF/-34oC. Slide-Lok garage floors provide excellent adhesion to concrete and do not require a separate or special primer. In addition, the slip resistance of Slide-Lok garage floors can be tailored to your precise needs with the addition of micro media agents. Consider Slide-Lok garage flooring not only for your garage, but also for your pool decks, courtyards, basements, and showrooms. When it comes to garage floors, Slide-Lok's the name to trust. Limited Lifetime Warranty -- Please contact us for details.